The MACH-ProZone features up to eight universal inputs and up to eight universal outputs with jumper selectable TRIAC configuration. 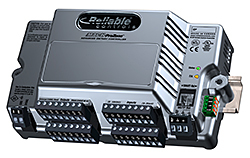 It is a fully programmable BACnet Building Controller scalable I/O in a small footprint. Ships standard with removable connectors and support for eight SMART-Sensors. Five year warranty.